I don’t really know how to describe it other than an epidemic. In two high profile incidents, white Police Officers have shot and killed unarmed African-American men. In Ferguson, in the case of Michael Brown and Officer Darren Wilson, Brown was shot six times by Wilson after the two got into some type of altercation. Wilson claimed that he fired in self defense against the allegedly aggressive Brown, and he had to use lethal force since Brown was apparently “charging” at him. The majority of witnesses claim that Brown had his hands up, was not resisting or some variation thereof. As I explained earlier in The Daily Texan, I think the evidence was insufficient for a conviction, but the very low bar to an indictment should have easily been cleared. Then, there is the case of Eric Garner in Staten Island. Approached by NYPD on suspicion of selling individual cigarettes, a rather low-level citation offense, Garner began arguing with officers. After repeatedly, calmly and peacefully attempting to argue with the officers, he was placed in a chokehold and tackled to the ground, where he was quite literally strangled to death. This, despite the fact that NYPD has prohibited chokeholds for about 20 years. The entire sickening incident was caught on video. Still, a grand jury this past evening no-billed Officer Daniel Pantaleo, who killed lynched Garner. Additionally, as the Texas Observer fills us in on (c/o the Beaumont Enterprise), a grand jury in Jasper County has opted to no-bill a white Police Officer who brutally beat up an unarmed African-American woman on video at the police station. Thankfully, unlike the other two incidents, this woman — who was accused of petty shoplifting — survived the encounter. Jasper, of course, has its own terrifying history of racism. All this is to say there is, in fact, an epidemic of police brutality in this country. The vast majority of Police Officers are honest, hardworking people who put their lives on the line for the safety of the community; but some harbor prejudicial tendencies and must be dealt with appropriately. For some time now, I have endorsed body cameras for officers. Generally speaking, they have been supported in a bipartisan manner. President Barack Obama has requested about $263 Million from congress to dole out these devices — which record officers’ interactions with the general public — to local departments. Similarly, District Attorney-elect Susan Hawk in Dallas County, a Republican, has announced a plan to use surplus funds to equip Dallas PD and other departments with the devices. KHOU has even reported, just a few hours ago, that Mayor Annise Parker plans on buying body cameras for local police with or without federal funds. I’m still a rather vehement supporter of this technology, as it minimizes he said/cop said situations. However, the Garner case still proves that a video is not enough to ensure justice is carried out. The good news, however, is that it removes the ambiguity and doubt that surrounds these cases. For example, in the Michael Brown case, I am not sure if Wilson was justified in his response or not, so I think there should have been a trial but — given the evidence known for certain — I don’t know if I would have voted for a conviction. In Garner’s case, however, there is almost no doubt in my mind that the Officer committed cold-blooded second degree murder. However, in order to truly fix the problem, the grand jury system needs to be reformed. State Senator John Whitmire (D-Harris County) has a long overdue idea in eliminating the venal key-man grand jury system, though it is worth noting that both the Ferguson and Staten Island no-billing occurred through random selection. I think the only way to solve this is to convert grand juries into far more temporary entities, operating on summons like petit juries, which may not be totally representative of the community but are still better than grand juries. Additionally, I think states should change pertinent laws regarding the burden of proof for police officers accused of such crimes, clarifying that it is rather low. The reason we have such easy indictments in this country is that convictions are unusually hard — compared to the rest of the world — to achieve. I realize these tweaks to state laws are quixotic, especially in Texas, but they appear to be the most effective way to resurrect some modicum of justice to our twisted world. Editorial note: This board will issue separate editorials in Senate District 17 and in House District 134. State Representatives Dan Huberty (R-127), Alma Allen (D-131), Sylvester Turner (D-139), Armando Walle (D-140), Senfronia Thompson (D-141), Harold Dutton Jr. (D-142) Ana Hernandez Luna (D-143), Carol Alvarado (D-145) and Garnet Coleman (D-147) are all unopposed. We will only issue endorsements for elections Statewide and in Harris County. We like to be bipartisan and support pragmatic Republicans. We –controversially– endorsed Congressman Ted Poe‘s re-election this year, and last year we named City Councilmember Stephen Costello (R-At Large 1) as the best Councilmember in Houston. We want to believe in a world where the parties can set aside their small-minded ideology and work together to come up with solutions to the State’s problems. A world where extremist rhetoric is just something for the television cameras, and grown-up mentalities arise behind the closed doors of the session. Unfortunately, we don’t live in that world. Only the willfully naive would actually think those idealistic goals are still feasible for the class running for the Texas Legislature as Republicans, or –for the most part– the Republican incumbents in the chamber. Accordingly, in overwhelming fashion, we endorse the Democrats. There just are not two reasonable perspectives on all too many of the issues facing Texas today. Giving equal rights to people on the basis of their gender or sexual orientation is no longer an issue that should be seen as having two serious sides. Supporting corporal punishment in school is not something that normal people support, and yet, the Republicans in the State Legislature back it vehemently. While there is a reasonable debate to be had on gun control laws, supporting legislation that would allow for the imprisonment of Federal officials attempting to enforce Federal law is not within its confides. Paul Bettencourt, the Republican candidate for this seat, currently held by outgoing State Senator (and GOP Lieutenant Governor candidate) Dan Patrick, served as the Harris County Tax Assessor for many years. To put it lightly, his tenure was egregious. Back then, and still to this today, Bettencourt has demonstrated a troubling unfamiliarity with the taxation system. Bettencourt supports the heavy reduction of property tax rate, without a legitimate plan to offset the lessened revenue. Such strong rhetoric absent meaningful political policies is truly not needed among those in the Texas Senate. However, we have yet to see any correspondence whatsoever from Bettencourt’s Democratic opponent, Jim Davis. He has no website, and has made no public statements on his candidacy thus far. Accordingly, we simply cannot support him in good faith. Rather, this board has decided to go with the Libertarian candidate, Whitney Bilyeu. Unlike the Democrat, Bilyeu has been remarkably active both online and in person, campaigning incessantly throughout the community. While she shares Bettencourt’s silly belief to drastically lower property taxes, at least she is under no illusions about the tough spending decisions that would have to be made under such a scheme. A divergent ideology is easier to work with than inconsistency with reality. Furthermore, we largely agree with Bilyeu’s positions on social issues, namely her opposition to the asinine prohibition on marijuana and her support for the 2/3rds rule in the Texas Senate. Therefore, this board endorses Whitney Bilyeu for the Texas Senate, District 7. 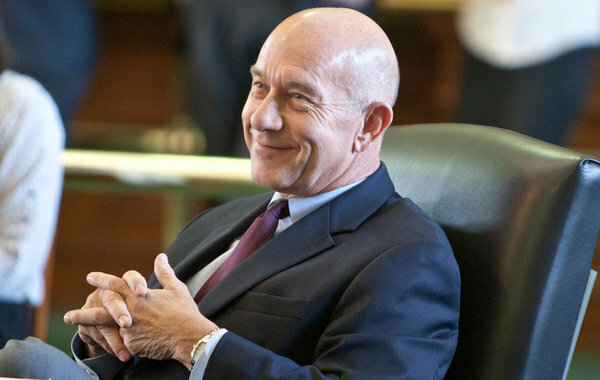 John Whitmire has honorably and capably served his constituents in the Texas Senate for more than 30 years, with an over-40 year career in the State Legislature. He currently serves as the Dean of the Texas Senate, a position that garners him a tremendous amount of respect from throughout both sides of the aisle. While we have certainly had some major qualms with Whitmire in the past, as we said last February in endorsing him over his Democratic primary challenger, Whitmire’s myriad strengths outnumber his weaknesses many times over. Using similar criteria, we will support Whitmire once again over his Republican opponent, Ron Hale. While Hale, who unsuccessfully ran for the Houston City Council last year, has many redeeming qualities, we agree with Whitmire on most of the divisive issues that we have previously noted. Furthermore, residents of District 15 would be foolish to throw away the unmatched representation they can receive from a Senator who commands as much respect as Whitmire. Accordingly, this board endorses John Whitmire for the Texas Senate, District 15. State Representative Patricia Harless, a Republican who has served in office since 2007, has supported many troubling right-wing causes, including the previously noted corporal punishment bill. She even was a prominent backer of the troubling “Guns on Campus” bill, which this board strongly opined against on numerous occasions. But her only opponent, Libertarian Cris Hernandez, has no footprint online or in person, and apparently no experience whatsoever in government or politics. We also have a feeling that his political views are not any better than Harless’. Accordingly, this board endorses Patricia Harless for the Texas House, District 126. By remarkably similar circumstances to the previously featured endorsement, this board chooses to endorse the Republican, Wayne Smith, the incumbent State Representative since 2003. His only opponent is the Libertarian, Ken Lowder. After many years, the incumbent State Representative, John Davis, will retire from his position representing a large constituency around the Clear Lake area. Davis was a comparably pragmatic Republican, one whose presence in the capitol will indubitably be missed. However, in a remarkably strange turn of events, both general election candidates for this post are ideologically consistent. The Republican, Dennis Paul, and the Democrat, John Gay, have Tea Party affiliated political views. Despite his evidently new partisan label, Gay has been active for many years in the bay region as an unabashed conservative. Accordingly, much like a primary election, we will determine who is the best candidate based on his leadership skills. On that front, the choice is crystal clear. The ostensible “Republican,” Dennis Paul, has years of experience in political wrangling and government affairs. Gay, on the other hand, has always been a fringe observer from afar. Thus, this board endorses Dennis Paul for the Texas House, District 129. By remarkably similar circumstances to the previous featured endorsements in HD126 and HD128, this board chooses to endorse the Republican, Allen Fletcher, the incumbent State Representative since 2009. His only opponent is the Green, Arthur Browning. State Representative Bill Callegari, a veteran of the Texas House since 2001, retired following last session. He was an inconsistent Republican ally for pragmatism and common sense, sometimes coming to the aid of sensible solutions and sometimes not. Unfortunately, in the heated Republican primary to succeed him, it only looks like more of the same. Mike Schofield, the Republican nominee for this position, still advocates for cutting government spending even more. This board pegs the question of, merely, how? How are we supposed to further cut spending with invaluable government programs, such as transportation infrastructure and education, already cut down to the studs? Especially when the state’s coffers are literally overflowing with surplus funds. Schofield’s small-minded ideology has clouded his ability to see what is, while losing track of what is truly best for Texas. Luckily, there is another option. Luis Lopez, the Democrat, has not only a greatly-inspiring life story, but a great grasp on the issues that represent deeply divergent points of view from Schofield. An immigrant himself at a very young age, he not only possesses the empathy needed to be an effective representative, but he understands the logistics of the issue itself. Lopez is supportive of compassionate-yet-realistic immigration positions. He would be a great improvement for the education system, and also supports the repeal of damaging anti-abortion legislation that endangers thousands upon thousands of Texas women. Accordingly, this board endorses Luis Lopez for the Texas House, District 132. State Representative Jim Murphy has capably represented his constituents for a few terms now, first from 2007 to 2009 and then from 2011 to the present. We have found him to be sincere in his convictions and working with good intention to best represents his constituents. However, the political views that he has espoused are dangerously out of step. As noted in many of the previous endorsements, we have a serious problem with legislators who have taken egregious legislative action, such as voting to condone corporal punishment in schools, standing against equal pay for women or denying gays and lesbians some of their basic human rights. Simply put, this board finds no possible way in which we could support Murphy for another term. Murphy’s opponent, Democrat Laura Nicol, presents plenty of her own concerns. She prompts a few questions about her preparation to hold public office, but we fervently believe that those concerns are heavily outweighed by the qualms we have with the incumbent. We believe that, at the end of the day, many of the positions that Nicol espouses are closer to our point of perspective, and so we will give her our nod. Accordingly, this board endorses Laura Nicol for the Texas House, District 133. State Representative Gary Elkins kept a rather low profile last legislative session, mostly staying out of the spotlight throughout contentious moments, and merely becoming one of the rank-and-file in the Republican caucus, voting for many of the unacceptable policies. However, Elkins’ great claim to fame came in the 2011 legislative session, when Elkins was one of the most instrumental forces behind the killing of a bill designed to reign in the usurious excesses of payday lenders. This, despite the fact that Elkins had a financial interest in no fewer than a dozen such lenders. His massive conflict of interest even drew the ire and rebuke of compatriots within his own party. However, this past session, Elkins was yet again a driving force behind the utter lack of any meaningful action to limit the despicable excesses of these loan sharks. We don’t really know much about Elkins’ Democratic opponent, Moiz Abbas. Frankly, we don’t really care. Either vote for him or undervote if you do not want to play roulette with your ballot. Either way, this board believes that you shouldn’t vote for Elkins. State Representative Gene Wu was named by this board as the Best Member of the Texas House in our rankings last session. We obviously believe that he deserves another chance to represent his constituents at the Capitol. At the time, we lauded Wu’s steadfast dedication to both doing the right thing in the House and trying to deliver up-to-the-minute information to his constituents via social media. As we said last year, the most impression action on the part of Wu –in our eyes– was his fiery pushback against a bill that would have criminalized so-called “ballot harvesting,” essentially making it illegal to be a Good Samaritan seeking others in voting. Thanks to the needed media attention to this bill that Wu was instrumental in orchestrating, the bill’s most draconian sections were nixed in the Senate. We find Wu’s Republican opponent, Morad Fiki, to be a man with noble intentions, but he is just not right for the 137th District. The people of Sharpstown deserve a true leader who will vehemently defend their interests and fight on their behalf. Thus, this board endorses Gene Wu for the Texas House, District 137. The incumbent State Representative, Mary Ann Perez, a Democrat, faces no credible opposition. We have largely been satisfied with her work as a legislator. Thus, this board endorses her for the Texas House, District 144. The incumbent State Representative, Borris Miles, a Democrat, faces no credible opposition. We have largely been satisfied with his work as a legislator. Thus, this board endorses Borris Miles for the Texas House, District 146. State Representative Jessica Farrar has represented her constituents well for nearly twenty years. As the Chair of the House Democratic Caucus, she is the de facto Minority Leader in the lower house. In this role, she has been spectacularly receptive and accommodating to the needs of everyday Texans. From social issues to economic hurdles, the middle class and poor of Texas have few greater advocates in the State Government than Farrar. She has a solid track record on leadership, and her constituents would be wise to send her back to the Legislature once more. Farrar’s Republican opponent, Chris Carmona, represents a new brand of Republicanism. He is younger, more inclusive and more pragmatic than most of his compatriots who hold high office. We wish him the best of luck in future endeavors and in any campaign to reign in the partisan extremes of his political party, but he is not right for the 148th District. Jessica Farrar is. As the Vice-Chair of the House Judiciary Committee, Farrar nobly leads on both law & order issues and justice issues. She bravely introduced legislation recently that would abolish the death penalty in Texas, a position to which we have concurred to consistently. Accordingly, this board endorses Jessica Farrar for the Texas House, District 148. Representative Hubert Vo has served as a good representative for his community for many terms. He meets his constituents and is receptive to their concerns. We think the voters of the 149th District would be wise to stick with their advocate in Austin and vote for Vo once more. By Hoang’s own admission, his candidacy is all about Vo’s opposition to an omnibus anti-abortion bill last year aimed at shutting down abortion clinics. This board proudly stands with Vo against the misguided piece of legislation, but we think that a political campaign should consist of far more than that. Of course, Hoang, who served on the Houston City Council until being thrown out by voters last November, should know that. Vo was right on that issue, but —more importantly— he is right on the way that he effectively governs in the neighborhood. Accordingly, this board endorses Hubert Vo for the Texas House, District 149. What can we say about State Representative Debbie Riddle, the Tea Party Republican who has represented this district in northwestern Harris County for many years? She is, at the core, a hateful person who all too often seeks to demonize members of the community in order to prove a political point. In 2012, she got into an online feud with a Law Student of Pakistani descent. After he critiqued the current foreign policy of this country, Riddle derided him in xenophobic fashion that he should move to Afghanistan, and a broad array of other sanctimonious and hateful notions. Thankfully for the voters of the 150th District, they have another option. Amy Perez, a schoolteacher, is a smart and energetic Democratic candidate that presents herself as a respectful, pragmatic and intelligent alternative to Riddle. She supports offsetting the harmful cuts done to public schools in recent legislative sessions, while Riddle evidently thinks their very existence is inherently hellish. Accordingly, this board endorses Amy Perez for the Texas House, District 150. The Texpatriate Editorial Board is comprised of Noah M. Horwitz & Olivia Arena of Austin, George Bailey of Boston, Luis Fayad of College Station and Andrew Scott Romo of New Orleans. Editorials represent a majority opinion of the board. Editorial note: This is the eighth in our series of electronic interviews with candidates for Statewide and Harris County offices. We have sent questionnaires to every candidate on the ballot, given we could find a working email address. We have printed their answers verbatim as we receive them. If you are or work for such a candidate, and we did not send a questionnaire, please contact us <info@texpate.com>. T: How long have your held this post? What number term are you seeking? T: Please list all the elected or appointed POLITICAL offices you have previously held, and for what years you held them. T: Please describe a bill that you have introduced, which has later become law. What did it accomplish, what were its purposes? If no such bill exists, please do the same for an amendment. JW: SB 344 created a writ of habeas corpus review and authorized relief of a conviction based on faulty or discredited scientific evidence. This new law has led to hundreds of reviews of cases and many overturned convictions and is the now the model for the nation. T: Please describe a bill that you have introduced this past session of the Legislature. What did it accomplish, what were its purposes? JW: SB 825 starts the statute of limitations on cases of prosecutorial misconduct to coincide with the release of the wrongfully convicted. This legislation was based on the wrongful conviction of Michael Morton and affords those wrongfully convicted additional time to pursue a case of prosecutorial misconduct. T: What role do you think a Texas Senator should have? JW: Representing their constituents in Austin. Shaping public policy that benefits Texans. Giving a voice to those who don’t otherwise have one. T: What is your opinion about the continued use (or non-use) of the 2/3rds rule in the Texas Senate? JW: Strong defender of the Senate’s 2/3 rule. JW: Education – continue to fight for increased funding and equity in our public schools. Healthcare – promote increased funding for the elderly, disabled, and fragile and support efforts to expand Medicaid in Texas. Criminal Justice reform – continue to lead the fight to expand rehabilitation, treatment, and alternatives to prison. Successfully closed 3 prisons in Texas. The Houston Chronicle reports that County Judge Ed Emmett, who is running for re-election as a Republican this fall, will be unopposed by serious competition after his Democratic opponent dropped out of the race. Ahmad Hassan, a small business owner, is a political gadfly who ascended to the nomination after being unchallenged in the Democratic primary. He has run for a couple of different offices, including both this one previously and Congress, both as a Democrat and a Republican. In short, Hassan is not anyone’s idea of the Democratic establishment. He was not recruited by the local party and, thus far into the campaign, has been a pretty lackluster candidate. No website, no online presence and no good faith effort to campaign within the community. I understand the idea of a cash-strung campaign running a low budget production, or someone with their own business limiting the time they take off from work, but a Facebook page costs exactly $0. Hassan said that he extensively met with Emmett recently, and was persuaded out of the race to allow Emmett to focus on his office and its duties more. Let me stipulate first that I too am a fan of Emmett, and I was planning on supporting him in November over his Democratic opponent. I think, like Hassan noted and Emmett delineated in his comments, that the County Judge has been an awesome representative of the people and continues to fight the good fight on many issues. He is the type of moderate Republican that I would literally love to see run for high office, but I could only imagine he would get clobbered in a competitive Republican primary, considering his support for things such as Obamacare and Medicaid expansion, as well as compassionate approaches to immigration problems. With that out of the way, I think Hassan totally made the wrong move in dropping out of the race. And I still hold it against the Democrats that a legitimate candidate did not run against Emmett. I don’t know why someone else didn’t run against him, and I am not being rude; I’m legitimately curious. Did the County Party make a decision not to contest the seat, or did they try and fail to recruit someone? I will freely admit that I do not know. Candidates deserve opposition. President Barack Obama deserved it, Mayor Annise Parker deserved it, State Senator John Whitmire deserved it and County Judge Ed Emmett deserves it. Opposition keeps both candidates and officeholders and their toes and compels them to defend their positions. It is a healthy part of the political process, especially for a job that only comes up for election every fourth year. The citizens of Harris County were deprived of such a fight with Emmett cruising to re-election. I’d vote Emmett for higher office, but I would like it even more if he switched parties. I don’t know if the Democrats would unanimously welcome him, but I certainly would! Update: As my friend Perry Dorrell at Brains & Eggs rightly points out, there will still be a second candidate on the ballot this November. David Collins, of the Green Party, will run for the post as well. His Facebook page has been attached at this link. I know, I know, the 2014 candidates are still in full swing, and then the 2015 municipal campaign (including a very exciting open Mayor’s race) will follow. But the 2016 election will soon be all-consuming in the world of politics, and I think a little crash-course in the candidates would be worthwhile, so one could simply jump right in the middle of the it all when the campaign inevitably becomes a tad less ambiguous. The 2016 frontrunners begin and end with Hillary Clinton. Honestly, I am not really quite sure how I should describe her title anymore, given that she has had so many important ones. Clinton served as the First Lady of Arkansas from both 1979 to 1981 and 1983 to 1992, while her husband Bill Clinton served as Governor. She then followed him to the White House, and served as First Lady of the United States from 1993 to 2001. 17 days before the end of her husband’s Presidency, she began serving as a member of the US Senate, a position she held until 2009. At that point, she became the Secretary of State for four years, all of President Obama’s first term. Oh yeah, and she ran for President in 2008, coming astoundingly close to besting Obama in the Democratic primary that year. In fact, Clinton garnered more than 250,000 more votes than Obama.